The relationship between red imported fire ants (RIFAs) and native ants is one of intense competition, if not all-out war. RIFAs usually win by attrition, but some native species can live with them, and other imported species can even displace them. The red imported fire ant is a pestiferous invader along the lines of the Mongol hordes. Having sneaked into the United States sometime around 1920, they have proceeded to colonize most of the Deep South and a few isolated areas of the West. They mess with pretty much everything: plants by disturbing the roots, other insects by eating them, small animals and birds by preying on them, people and livestock by biting and stinging them. They even start fires by nesting in and shorting out electrical equipment. They have no serious natural enemies here, and this gives them a whopper of a head start on native species. They create large colonies -- sometimes with multiple queens -- and reproduce rapidly. They eat anything and everything, from grain and seeds to baby birds and lizards to greasy drippings in the bottom of your barbecue pit. They're more aggressive than a wolverine on steroids, and if anything disturbs their nest, they swarm it like killer bees. 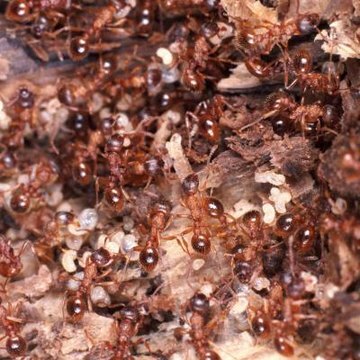 Native ants in general suffer from competition with fire ants, and some have been reduced in population and run right off the fire ants' range. However, other native species can hold their own. In Texas, the big-headed ant, the little black ant and the pyramid ant fight back by raiding fire ant colonies and have been known to kill off small ones. They also eat fire ant queens that have completed their mating flight and lost their wings, but haven't yet dug in to lay eggs. Since RIFAs tend to stick to watersides and other moist habitats, not all native ants are threatened by the invaders. Native ants have at least one ally in the battle against the invaders: the armadillo. The nine-banded variety, itself an immigrant, has expanded its U.S. range to include most of the fire ants' territory, and it delights in digging up fire ant mounds to snack on the developing broods. Unfortunately, there just aren't enough 'dillos to do the whole job. The natives are now getting some human assistance in the form of RIFA-specific phorid flies scientists and land managers are releasing into fire ant areas. Like tiny smart bombs, these flies (also called decapitating flies) parasitize their target ants by laying an egg in an ant's head; the egg hatches into a larva that eats the fire ant's brain until its head falls off. Other fire ant foes from their South American homeland, such as certain fungi and nematodes, are being studied as control measures. One of the newest fire RIFA deterrents on the scene is the next wave of illegal immigrants, the raspberry crazy ant. The cure may turn out to be worse than the disease, however, as the crazy ants can be even more of a nuisance -- they don't bite or sting, but they also don't have the colony boundaries of RIFAs and they love to move into your house. They're also more numerous than RIFAs, and equally omnivorous. Where crazy ants flourish, RIFA numbers decline; whether this is due to crazy ants monopolizing the food supply or because the crazy ants actually attack and kill the fire ants is still undetermined. National Geographic News: Alien Flies to Extinguish Alien Fire Ant Invasion?